You are here: Home / Living in Hilo / Who are the Best Termite Control Companies in Hilo Hawaii? Who are the Best Termite Control Companies in Hilo Hawaii? Having lived in Hilo for a long time, I know that termites can be an enormous problem. Left unchecked, they can completely destroy your home or shave tens of thousands of dollars off your home’s value if you try to sell it. So if you own a home in Hilo, it is not a question of when you will call a termite control company, it is only a question of when you will call one. Everyone knows that termite control is not cheap and everyone also knows that if it is done poorly a lot of things can go wrong. So choosing the best termite control company in Hilo to treat your home is imperative. Here is a list of some of the companies that have a long and successful history of providing termite control services in our rainy little town. 1. Hilo Termite & Pest Control: Has been in business since 1963, when it was started by Shizuo Ono. It is one of the larger firms in town and it provides a full range of termite and pest control services in Hilo, including Sentricon for ground termites, tent fumigation for drywood termites and termite inspections require for home sales. It is a member of the Better Business Bureau and it provides free estimates. 2. 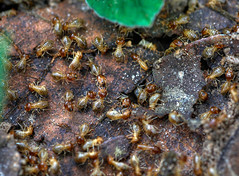 Akamai Pest Solutions: Serving the Big Island since 2003, is a newer company and it distinguishes itself by being the first to offer Orange oil treatment for drywood termite control which means that no tenting is required. It offers treatments that are pet and child safe, so it can be a good company for those with young keiki. 3. Mason Termite and Pest: Provides same day and emergency service. It is also open for the longest hours: 8:00 AM to 5:00 PM Monday through Sunday. 4. Will Kill Pests: Is owned and operated by Will Lee, who has been in the termite control business for more than 13 years, hence the name of their company. They have been in business since 2005 and are quick to respond to calls. 5. Bowman Termite: Is operated by Bruce Bowman who has been in the termite control business since 1978. By providing excellent service it has grown to become one of the larger locally owned termite control companies providing quality service in Hilo of course and on the neighbor islands. If you are looking for a termite control company you might also like to read: How much does Termite Control Cost in Hilo?.